On a cool, clear Austin weekend, a group of experienced game designers gathered for their yearly retreat. At night they swapped stories of an industry in turmoil. As social games and mobile games rewrite the landscape, power struggles between business and design dominate and designers find themselves being sidelined or abused. And the products they work on suffer horribly as a result. It is a time when musty old assumptions are questioned. It is also a rare opportunity to identify universal best practices that can help us navigate new platforms, new genres and new gaming experiences. So during the day, we asked ourselves some hard questions. When was design successful? How do designers hurt their own credibility and effectiveness? This is a group that has shipped hundreds of games serving well over 100 million players. Over the past two decades, we've personally seen game titans rise and fall. Surely there are patterns and cycles. So we listed dozens of examples of great design environments and dozens more of times where design remained shackled. And over and over again, the same themes came up. To guide game designers and the profession forward we wrote down a Declaration of Game Designer Independence. This document is primarily for the designers who run their own companies or the creative directors who own the creative process. It is also for the designers in the trenches, who aspire to a leadership role. The following is a code for how great, visionary designers should behave. It rises up from an immense well of hard fought experience accumulated over decades of real world design. When followed, these practices sustain an environment where design thrives and revolutionary games are regularly brought forth into the world. You can get rid of visuals, music, business or technology and we will still make great games. We are prime movers, not replaceable cogs. We speak the language of creative. All art and music ultimately serves the game play. We speak the language of production. Game design determines the scope and need for the content that production shepherds. We speak the language of engineering. Technology is one tool that enable the experiences designers choose. We speak the language of business. Modern monetization, retention and distribution are directly driven by game systems. We tirelessly promote our vision both internally and to the public. We then reinvent them to be better. Create with our own voices or sell our talents into servitude. Not everything here is easy. To live up to this declaration, you likely need to be a better designer than you are right now. Still, always remember: You are not a slave. You are not a servant. You are not a cog-like employee. You are a creative force. And most importantly you have a choice for how you wish to spend your time on this earth. You can choose to take control of your life and change the world for the better in the process. I personally left a large company with a steady paycheck in order to take control of my creative destiny. Now I've got multiple game designs speeding towards completion, I'm working with people with souls and the future looks amazing. This is easily the most productive and exciting time of my life. And the only reason it happened was because I realized a fundamental truth: Design works best when it leads, not when it serves. If you support the Declaration, drop a comment below. Pass it on via Twitter, Facebook, Email, Forums and more. Pass it on to the people who need it the most. PS: For a more in-depth look at our report, check out the Project Horseshoe website. There are some wonderful reports this year. For my part, I agree. "So we listed dozens of examples of great design environment and dozens more of times where design remained shackled." What were these games? "You can get rid of visuals, music, business or technology and we will still make great games." I think it means that even with the lack of those, great games can still be made. It doesn't mean ditching all the other team members and work on the game alone. "Design works best when it leads, not when it serves." This is a great piece in general. And when I consider that it's a mission statement, produced by a committee, addressing the modern game development industry. . .I don't I've ever seen those factors produce something clearly-written, insightful, AND persuasive. I've spent the last few years struggling to explain myself to programmers, artists and producers. You've just given me 5 years' worth of progress on that explanation, minimum. Concerning the "Board of Certification Proposal" discussed in the document linked above, are you seriously proposing -- by stating candidates must "take several part tests [...] which ensure that the candidates have a minimum necessary vocabulary and skill set to be called a Game Designer" -- that only those who are certified by said board should be able to call themselves game designers? If so, I'd like to remind you the term "game designer" is generic and cannot be claimed as the exclusive property of any certification body. A game designer is someone who designs games whether or not they also have, in the opinion of the Board, the "skill set to be called a Game Designer". This declaration is great in some regards and lousy in others. Point one cannot be emphasized enough. It needs to be told, it needs to be argued, it needs to be demonstrated, until a majority of game developers will start getting it. Point three, on the other hand, is incredibly snobbish. Every single great game designer started out as a dilettante. Every. Single. One. To turn your nose at amateurs is to reject the great game designers of tomorrow. Judge the work, not the person; that's equally valid in art as in science. Besides, while I understand the reasons for this declaration, I can't help but wonder, what exactly keeps you people chained to abusive employers? You're treated poorly? Walk away! You can earn more money by yourselves anyway. That is, of course, if you're good, but this declaration implies you are. Marcos: it's also possible to make board games; a few video game designers I know also make board or card games on the side. I sign. I'm constantly fighting with coders thinking that making games is just about technology. Point one is great. ...I think, Marcos, he first needs to learn basic computer typography: just one space after a period at the end of a sentence. Never more. Never! You're not using an IBM Selectric. For example, "You can get rid of visuals, music, business or technology and we will still make great games." Perhaps. But perhaps such will be played by no one. Do you score that a success or a fail? You say, "Without game design, there is nothing" - that doesn't mean anything. Anything. "Without cheese, there is nothing", "Without quatloos, there is nothing". Only when you get to some rare things like, "Without love, there is nothing" does that kind of line make any sense. 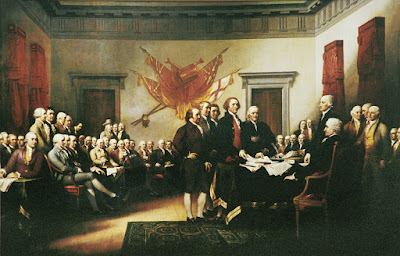 Perhaps I'm the only one who thinks this, but is a "Declaration of Game Designer Independence" really needed? Will this make one iota of difference? This rant seems to mostly be about how a bunch of game designers are regretting their past. Check. They especially didn't get enough credit. (Like who does at any big company?) But this is not news; the big game industry has always been poor at promoting Game Designers (with some exceptions), to their loss. Yes, yes, if you want your name in lights and want to design whatever you want, you have to form your own company. This is no revelation and no reason to create this "Declaration of...". But I can't help thinking that these same disgruntled/past-regretting game designers could have quit the big company they worked for earlier than they did and therefore could have created their "vision of game" sooner than they have (if they ever have). At this time in Gamedom, there are more outlets (forms, platforms, etc.) to create your game in than anytime in history. A tiny independent company can even make a small fortune (like some of the iPhone guys and the Mindcraft dude have just done). Even you, Dan, have sneaked to top of Kindle game sales...please don't wreck your Ferrari. Summing up (why not?) - I don't feel Game Designers are being suppressed in the quantity and manner that requires some sort of "declaration". Instead, I think of now as the chance for the Second Golden Age of Game Design (the first one was in the Eighties, in case you missed it). Will it be seized? I appreciate the general message and the impetus for its creation, but this leaves something of an unpleasant aftertaste. It echoes of perceived victimization, and despite the good bits, feels swaggering. Could the declaration also be tempered somewhat by a touch of nuance or humility, and a focus on the quality of what we try to create, regardless of corporate or independent context or limitations? Is abject servitude vs. independent creation such a distinct binary? Can we be more inclusive? It reminds me of the "design is king" sentiment. Things always seem to be more complicated than that. Does this mean to the authors that I just don't have what it takes to be a designer of the calibre being discussed? Nice Article I Like It.. Yes, but you'll only make board games. I know the article doesn't mention 'video games' but given the people involved and the context of the whole website, it's clear that video game designers are the subjects. As such, I'd argue that you can get rid of everything but the programmers and you'll still be making games. Take that with a pinch of salt though, since it's coming from a programmer with design tendencies. I'm in the "like it but geez does it have to be so melodramatic?" camp. It's like someone read too much Ayn Rand. He is talking about amateurs that are not serious but pretend to be. Where do I send my signed copy? As much as I want to be enthused by this declaration the only truth I find is in the title. . . A Designers freedom is found in independence. Creative freedom has always been restricted to designers, regardless of the field they work in by a single simple matter. We are not Artists in the traditional sense of the word, we can't forget that we are commercially lead to create a product that sells in a market. We work in a team drawing a wage for producing what the company managers and directors see as being viable. Its our job to mask as many mistakes created at the projects signing, use preproduction to be as creative as possible and spend the rest of the project playing nurse. If through the process of learning the trade of game design you feel secure enough in your own talent and skills to produce a meaningful game then there is nothing stopping you. I feel it would be more productive to the advancement of Videogames as a medium of expression to make our presence as game designers known to each other and find a way to promote communication between us. It's the restrictions of setting up as an independent that needs to be addressed not a call to arms to draw a bitter line in the creative sand. Spanish Translation: La Declaración de Independencia del Diseñador de Juegos. I rather like the grandiose expression of these points. True, some of them may seem like simple common sense, but sometimes people need things spelled out so they have something solid to hang a thought on. I intend to accept the Declaration as a challenge and strive always to live up to it. - i certainly agree with this. Designers should have a vivid picture of the whole game so that they will be able to translate the actual design easily.